A grilled flank steak, or London Broil. Photo courtesy WomackFarms.com, producers of naturally raised Angus beef. Flank steak is a cut from the abdominal muscles of the steer. 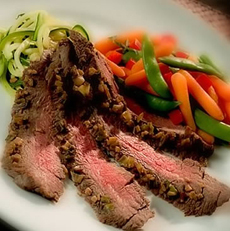 A relatively long and flat cut of meat, it is served as London broil and for fajitas. Tasty as it is, flank steak is a tougher cut and should be marinated prior to grilling. The marinade serves as a tenderizer that also adds flavor. Here are chefs’ tips for the best way to cook a flank steak. POUND. First pound the meat on both sides, between plastic wrap. MARINADE. Prepare a marinade. While many people grab a bottle of commercial Italian dressing, it’s easy and less expensive to make your own marinade. RECIPE: For a two-pound flank steak, combine two teaspoons of acid (balsamic vinegar, plum vinegar, raspberry vinegar or red wine vinegar; red or white wine, rice wine; or lemon juice); 1/3 cup olive oil or yogurt (the helpful bacteria in yogurt make it an excellent tenderizer); 2 minced garlic cloves; 1/3 cup soy sauce; 1/4 cup honey; 1/2 teaspoon freshly-ground pepper and sea salt to taste. FLAVOR: You can add more dimensions of flavor with herbs (fresh chives, cilantro or parsley), spices, orange juice, wine, etc. MARINATE: Add the meat and the marinade to a plastic bag and marinate for several hours or overnight in the fridge, turning the bag several times. GRILL: When ready to cook, towel off the excess marinade. Grill 5-7 minutes each side for rare, 7-10 minutes for medium. Don’t cook beyond medium or the meat will be tough.